Here's where things get interesting. I ran two tests, in one I extracted a 5GB archive and tried to run Photoshop after 30 seconds of extraction and in the second test, I extracted a 5GB archive and tried to scan my system for viruses using NAV 2008. Simple enough, right? I'm reporting the times of each task individually. Launching Photoshop took 5.2 seconds for the Samsung SLC SSD, it was like we weren't even running another test in the background. The X25-M did fine at 12.2 seconds and the VelociRaptor was much slower at 27.3 seconds. The JMicron based MLC drives didn't do too bad here either, although they were a little slower than Intel's MLC offering. The WD 1TB drive would always complete the extraction task quicker than all of the other drives, but paid the penalty in the scan test (which is why you have to look at both charts for a full analysis). 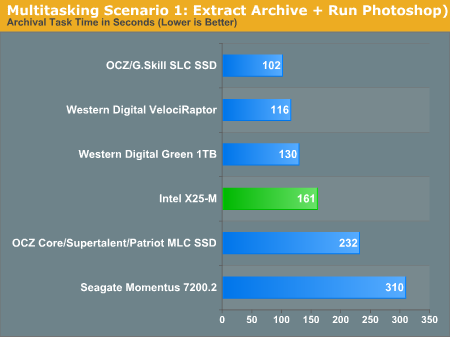 The Samsung SLC drive is still the overall winner here, followed closely by Intel's X25-M. The JMicron based MLC drives do horribly here, taking over twice as long to complete as Intel's MLC. The mechanical disks however do a lot worse. 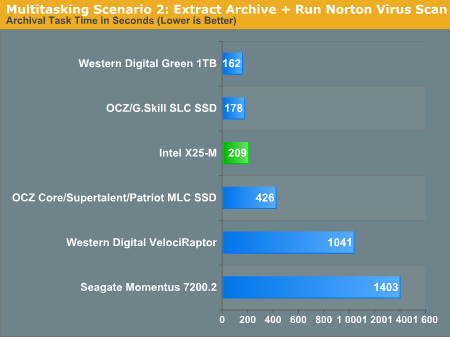 While the Intel X25-M took 3.5 minutes to extract the 5GB archive, the VelociRaptor took over 17 minutes. 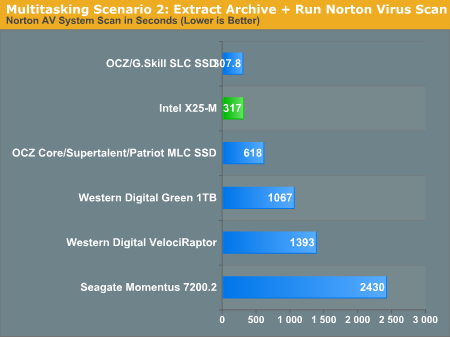 The Seagate Momentus 7200.2 took over 23 minutes! The X25-M took around 5.3 minutes, the Raptor needed more than 23 minutes and Seagate Momentus made me wait over 40 minutes. 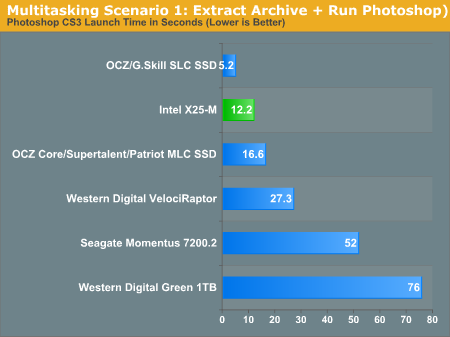 It's these sorts of usage scenarios that really make SSDs worthwhile, and they are the most realworld you can get. When we started looking at real world performance the PCMark Vantage numbers may have looked a bit ridiculous, but by now you should see that they are more of the middle ground when looking at performance of these drives. There are optimization methods available for SSD's which can mitigate performance loss through genuine usage over time. One such is Diskeeper's HyperFast Technology. I read the pdf article you linked from Diskeeper. Based on the information Anand has given in his articles about Intel's technology, Diskeeper's "whitepaper" sounds like crap advertising by a company who's afraid their technology might be considered not only useless but detrimental to use with SSDs. I'm inclined to agree since Diskeeper's own results show a 4x write loss by just *one* "optimization" while Anand's article clearly suggests that the proper design (which he says Intel has accomplished) eliminates the need for Diskeeper's service. Until I find more thorough examination of the facts, Diskeeper's remarks make me distrust them. On the other hand, Anand's article definitely sounds not just like a puff piece for Intel, but qualifies in my mind as advertising. Wonder how much money Intel has spent on Anandtech? That's not to suggest that anything is misrepresentative (well, it wasn't meant to sound that way, but keep reading and you'll find the one-sided praise will later be partially retracted and I don't know the end of the story yet), but we all know that advertising always leaves out the negatives. One such negative was the promotion of the life of the drive. "20GB a day for five years"? Anand praises Intel for multiplying that by five to "100GB a day for five years" but then tells us that they'll only guarantee the drive for three years and has the audacity to suggest we'll likely have a recourse "if we can prove" ... -- how is anyone going to prove how many GBs a day they put on their computer? The annoyance of trying to keep track is not something 99% of people would do. Did you do the math to see how long it takes to write 100GB to a drive with a write speed of 200MB/s? Eight minutes and twenty seconds is all it takes. Well, that's great if all you use your computer for is reading articles, checking the news and sales prices and sending email. The drive should last as long as your computer. But if you love video (who loves video??? ), it's a different story entirely. There's another negative that, though first denied, eventually was acknowledged. More than six months later, Anand reports back and says essentially, 'Intel is still the best but the performance does degrade with time and I don't know why.' If he's explained it since then, I've yet to read it. read/write speed is 220/200 mb/s. Legacy OS like Windows Vista, XP, and Applications like Microsoft Office 2003, 2007, etc. have built in, inherent flaws with regard to SSDs. Specifically, optimizations of these OS for mechanical hard drives like superfetch, prefetch, etc. tend to slow down, rather than help performance and is unnecessary to speed up reads in an SSD, but slow it down with unnecessary writes of small files, which SSDs are slower than a regular hard drive. Things like automatic drive defragmentation with Vista does nothing for SSDs except to slow them down. Properly optimized, even low cost 2007 generation SSDs test out as equivalent to a 7200 rpm consumer grade drive, and typical SSDs made in 2008 or later tend to outperform mechanical hard drives. The tests done here have done nothing to "tweak" the OS to remove design hindrances to SSD performance, and thus, have no validity or technical merit. The test, as presented, would be similar to installing a 19th century steam engine on a sailing ship, and observing that it is rather slow ---- without mentioning the drag and performance hits caused by the unused sail rigging, masts, etc. See the discussion here for a detailed discussion of SSD performance tweaks and what it takes to make them perform well with legacy OS and Applications.